The top 10 picks of the 2014 NHL Draft from the Wells Fargo Center in Philadelphia is in the books. 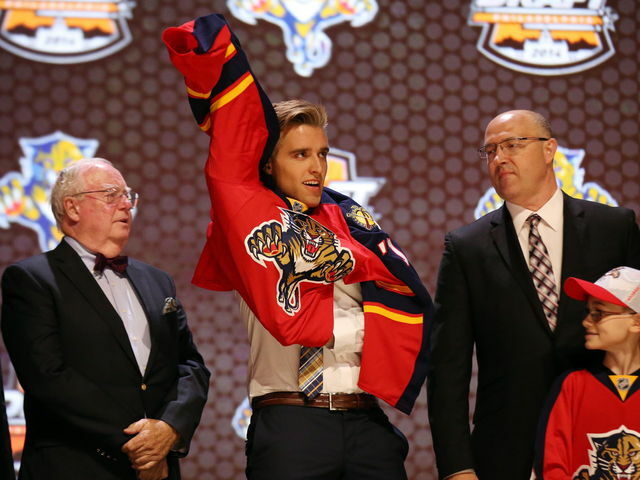 The Florida Panthers drafted defenseman Aaron Ekblad with the first overall pick. He is regarded as the best defenseman. “I feel like I can step in next year and make a difference,” Ekblad said. With the Barrie Colts in the Ontario Hockey League, he had 40 goals and 76 assists. He was also named the best OHL top defenseman during the 2013-14 season. The Buffalo Sabres drafted center Sam Reinhart with the second overall selection. He is the third Reinhart brother to be selected in the NHL draft in recent years. Griffin Reinhart went in the Top Five to the New York Islanders in 2012, while Max Reinhart was a mid-round pick by the Calgary Flames in 2010. The Oilers moved quickly to take Leon Draisaitl with the third overall pick. Draisaitl, the German International, is the highest German player drafted in a North American professional sport since 1963 when the Boston Bruins selected Orest Romashyna third overall. The Oilers compare Draisaitl to Anze Kopitar of the Los Angeles Kings. Sam Bennett went to the Calgary Flames with the 4th overall pick. Bennett was the top North American skater drafted. He plays hard in all three zones, but he turned some teams off with his colored perceptions. Michael Dal Colle was drafted by the New York Islanders with the fifth overall pick. The left-winger scored 95 points in 67 games with the OHL’s Oshawa Generals. He also represented Canada in the 2013 Ivan Hlinka Memorial Tournament, winning gold. He is expected to be a goal scorer for the Islanders. The Vancouver Canucks selected Jake Virtanen with the sixth overall selection. This is a homecoming for Virtanen, as he is from Abbotsford, British Columbia. He is the first British Columbia player selected in the first round since Cam Neely by the Canucks in the 1983 draft with the ninth overall selection. “That would be so sick if the Canucks picked me,” Virtanen recently said to his father. The Carolina Hurricanes took Haydn Fleury with the 7th pick. He is a a strong skater with NHL size and a physical edge to his game. He is a a defender, who can play two-ways and has very good average tools. He also has logged a lot of time with the Red Deer Rebels. William Nylander was drafted by the Toronto Maple Leafs with the 8th overall pick. Nylander is the son of former NHL player Mychal Nylander. He also played in three different teams during his time in Sweden. He played for Modo Hockey Ornskoldsvik, Rogle BK, and Sodertalkje SK, where he had 34 points in 57 games. Nikolaj Ehlers went to the Winnipeg Jets with the 9th overall pick. He is the second-highest player, who was born in Denmark to be drafted. Mikkel Boedker was selected by the Phoenix Coyotes, now the Arizona Coyotes, in 2008 with the eighth overall pick. This season, with the Halifax Mooseheads, he had 49 goals and 55 assists in 63 games. He added 11 goals and 17 assists in 16 playoff games. He also earned the CHL’s Rookie of the Year award. The Anaheim Ducks drafted forward Nick Ritchie with the 10th overall pick. This pick came to the Ducks in the Bobby Ryan trade when he was dealt to the Ottawa Senators last summer. Ritchie is ready to play right away, and has NHL caliber speed. Many teams had concerns over his inconsistency took him away from being a Top five pick. He is the younger brother of Brett Ritchie, who is expected to play for the Texas Stars, who recently won the American Hockey League’s Championship last week, this upcoming season. The older Ritchie was a second round pick by the Stars.